So... Josh is in some class he has to take before he's an official instructor or something. It's a general purpose, all-around, everything class. They cover health and welfare, STD's, nutrition, blah blah blah... common sense stuff (that's not really common, as it turns out). OK now for the bragging. 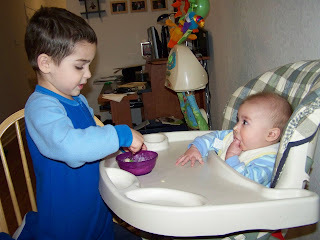 Noah loves feeding his baby brother. Tristan doesn't mind it at all. Although I think he gets a little peeved when Noah is more focused on stirring the cereal rather than shoveling it into Tris's mouth hahaha. I've been trying to upload the video, but it doesn't seem to be working. I put it on the scrapbook site like I usually do. That uploader just works better than the blogger one for me. It was so nice out yesterday that my neighbor and I decided we should take the boys out to the park. Heather has lived here longer than I have so she knew of a pretty sweet park for us to visit. Pendleton-King Park, which is pretty close and easy to get to! We trudged through the woods for about an hour and a half or so. The boys all really enjoyed it. 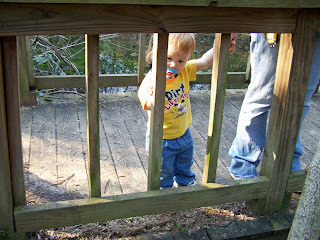 Heather's son, Caleb is 15 months old and SO CUTE! 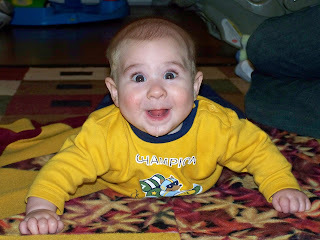 Seriously... it's just scary how cute this little boy is. I'm sure Heather and I will be hanging out more so I will get better pictures. Some of the trees out there had ginormous leaves. The leaves were bigger than Noah's head! We were all chillin' in our room before taking another trek out to Michael's. We love family wrestling time... essential for boys :) Josh and I have been itching to draw lately so we wanted to pick up more supplies. Noah and Tristan both love Michael's because it's so colorful and chock full of interesting projects. We got a couple books. I got one on drawing faces and Josh got one on drawing dragons. We stayed up drawing until around 11:30. I'm not done with mine yet, but I'll be sure to post it! 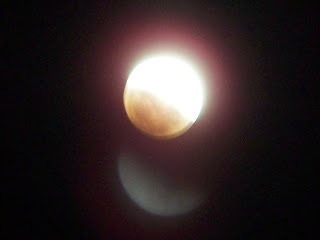 Hopefully you all know we had a full lunar eclipse last night. I got a few really cool shots. It was near impossible to get the camera to focus at all before the cycle was complete because the light was just so bright compared to the night sky. PLUS I was still figuring out my tripod (which once I figured out a few things I realized is AWESOME thanks V!!) and the settings to use. I ended up using the night landscape dummy setting and the timer so that me pushing the button wasn't screwing with my shot. I think it turned out pretty stinkin' cool! 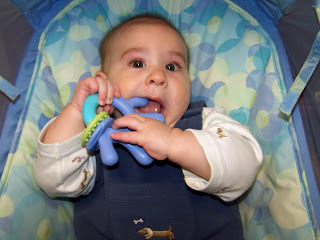 Noah was feeding Tristan his fingers. Don't be taken aback by Noah's yelling at the end... he always yells, but he isn't actually angry. I think he just... well I guess he just likes to yell!!!! I know I yell a lot. I'm a loud person, what can I say :) GOSH!! This is Noah's new puzzle. Josh found it for him. One side has a pirate ship all colored in and the other side is just white. It came with some crayons and we've been working on coloring it in these past few days. Noah loves it of course. 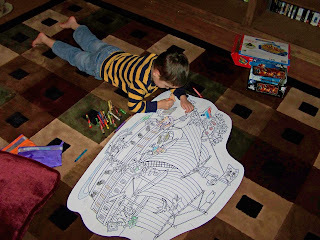 He is coloring like a big boy now, trying to stay in the lines. He also draws some pretty cute pictures of bugs and people. I am going to laminate a few to keep. I'll be sure to post them when I have the chance. He just came running in here with his bike helmet on... apparently watching TV can be very dangerous. Here's my little blonde baby finally smiling for the camera. Yes, his hair really is that light (unless it's wet haha). It makes me feel good because he looks like me in some tiny little bitty way. 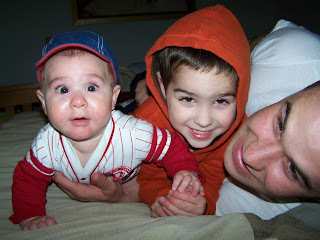 He is still yet another Josh clone, but he has my eyes and my hair (and both boys have my ears) so HA! I just wanted everyone to know that this is generally how Noah looks throughout the day. I don't know why he insists on wearing his bike helmet all the time, but he does. If he goes outside he has to have the helmet... shoes are optional, but not the helmet. He's such a weird child. 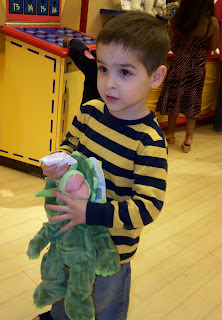 We took Noah to the Build A Bear workshop and let him make his own triceratops! I was almost disappointed because he didn't seem excited at all, but once we got out of the actual store I could tell he was thrilled. I think it was just too loud and crowded in there for him. He really didn't understand what was going on until it was over. I would have explained it to him, but it was LOUD in there. Poor Tristan lost it a few times from the sound of the "stuffing" machine. He did not like it one bit. We put a roar button in the dinosaur and Noah pushed it as we walked through the mall. Noah always loved this little seat and Tristan surely does too. You can really see how pretty his eyes are. I think they've changed a bit and he just might end up getting away with not having brown eyes! They look different, depending on what he's wearing. I guess that means they're hazel. He could not get enough of this cup. It made it pretty difficult to try and rinse him off because he'd grab at the cup anytime it was near his field of vision. 5 months old is a pretty big deal for me. 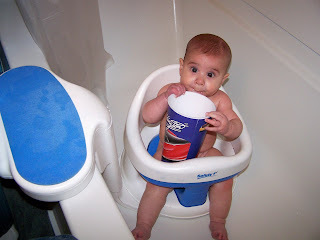 I washed up the high chair and the bath seat today, and got the floppy seat out too (it's a shopping cart seat cover). Tristan is too squirmy to not be in a seat in the tub anymore. He rolls from side to side, front to back, back to front. I put him in the high chair and let him try some cereal again. He LOVED it. It's probably going to be a nightly thing now. I have to move everything far away from him since he's gotten pretty good with his hands now. He's also quite skilled at sitting (provided he has back support). He sure is growing fast! 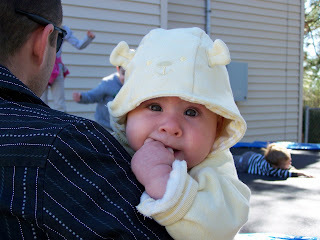 We met some people the other day just from being outside and were invited to their son's 3rd birthday party today. There was cake and goodies galore. The kids jumped on their trampoline and got to hit a pinata too! All the kids played really well together. We didn't get to stay too long because Tristan needed a nap, but we had a great time. First Night in the... Crib?